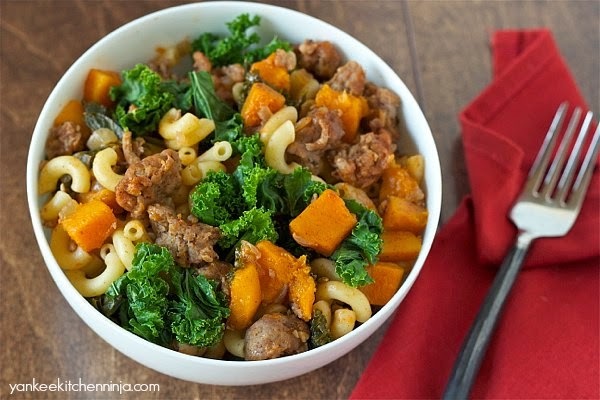 And, because it's how The Ninj rolls in her quest to show you that eating healthy can be quick and easy, this butternut and sausage chili mac takes less than a half an hour to prepare. Yes: Right now, you're less than 30 minutes away from a healthy, filling and amazingly yummy dinner that tastes perfectly in season. Are you a butternut squash fan, too? Would you drink my butternut-spice latte next year? Leave a comment: The Ninj wants to know. While pasta cooks, heat the oil a large pot over medium heat; add the sausage and cook, using a spoon to crumble, until browned, then remove from pot and set aside. Add the squash, onion and garlic to the pan and cook for about 5 minutes. Next add the tomato paste, flour, salt and pepper, stirring continually for about 1 minute. Add the stock and gradually bring the mixture to a boil, cooking for another few minutes until the squash is just tender when pierced with a fork. Add the kale and cook until it just begins to wilt (don't overcook it! ), then return the sausage to the pot. Season to taste with additional salt and pepper. Serve the sausage mixture over the pasta, Cincinnati chili-style. Wow does THAT look good! Love how you worked some kale into this recipe, too. 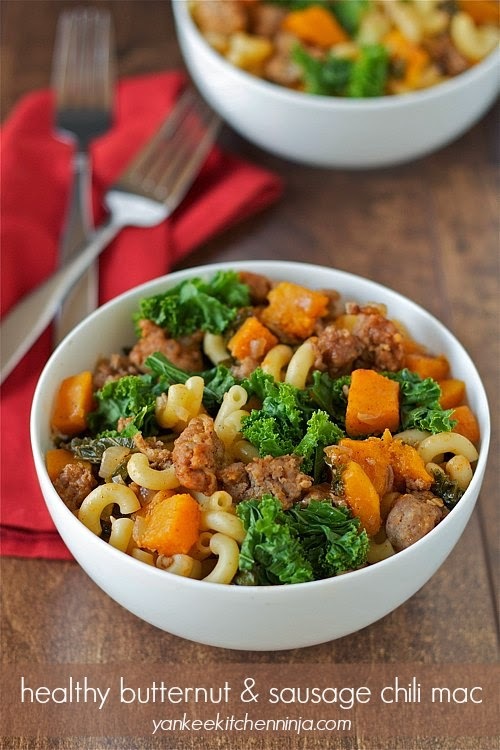 We're adding butternut and sausage to our shopping list right this minute. We're going to share this link on our social media so everyone can see your lovely photos and your recipe. Oh, it is, Eileen -- hope you enjoy it! Thanks for the pin love, dude!